Starwind like many other software vendors has jumped into the “Hyperconvergent train”. Starwind Software is known for their flagship product Starwind SAN which is already on v8. But since recently they’re also offering bundles (software + hardware + backup + management). They’re proposing bundles for small, medium or larger business starting with 2 nodes or more, where the storage traffic flows through 10GbE nics which also uses direct-connect (or switch-less) connectivity. This brings some savings as we know the 10GbE switches remain expensive part of today’s infrastructures. The configs can also evolve by adding switches/nodes. Depending of the offer, the more powerful solution can scale up to 64 nodes! 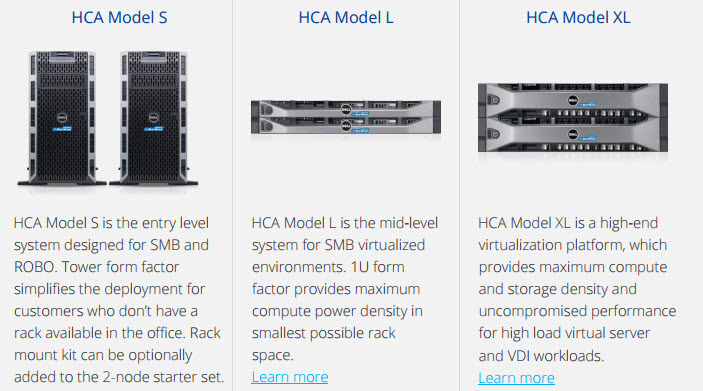 Let’s have a closer look at their offering from their Hyperconverged appliance page. 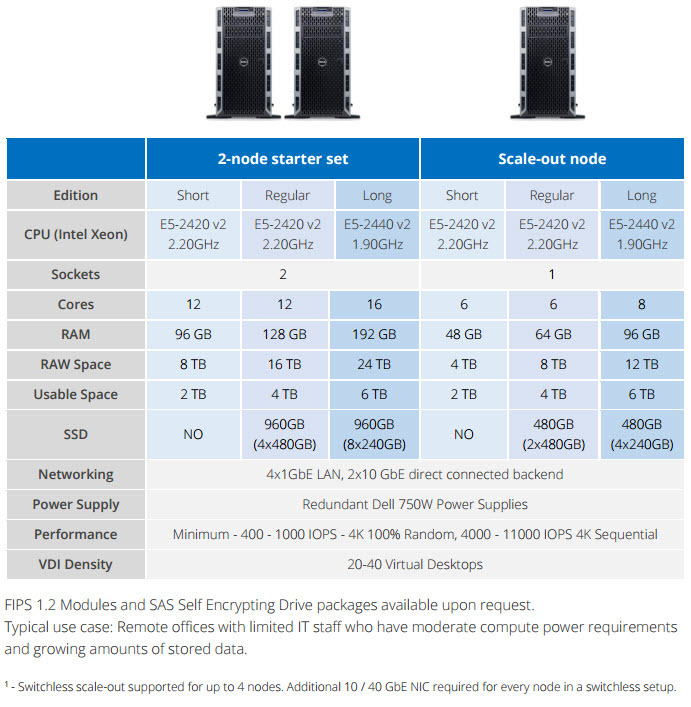 Their solution uses Windows Server 2012R2 or Hyper-V Server pre-installed on both nodes. Unlike VMware’s offering of their 2 nodes ROBO and VSAN, Starwind’s solution does not need a witness component as it mirrors the data with synchronous replication. So if one node goes down, the VMs running on the failed node, restarts on the remaining node. This allows simple and cost effective solution for Small Business customers. Starwind does partner with Dell (now owner of EMC ) for the hardware. Many other hyperconverged vendors like Nutanix or Atlantis do partner with Dell as well. The hardware solutions from Starwind are different kind depending of the client’s need, the size of the enterprise, the workload (VDI or Server virtualization). Let’s have a look at the hardware which you can find on the datasheet available via their Hyperconverged appliance page. The smallest model (Tower) called …. 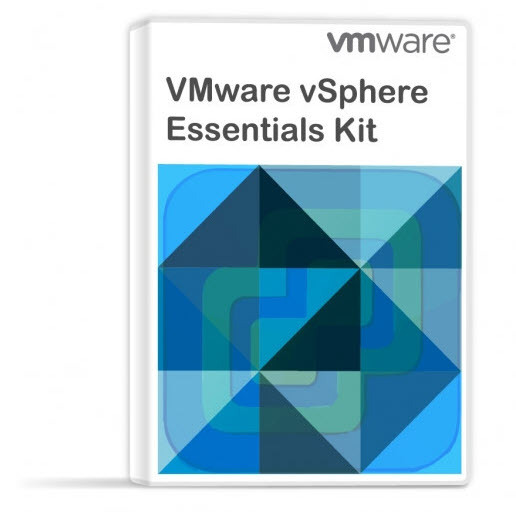 The starter set packs all the essential components of the virtualization appliance in just 2 servers simplifying the configuration and minimizing the initial investment. When used with 10GbE switches the solution can scale up to 64 nodes! It’s HCA Model XL which does that. The bundles has two main advantages compared if you want to pick up your servers, software, networking…. by yourself. The first one is the warranty as if something goes wrong you only need to deal with Starwind, and not with Dell. It works similar way as VMware ready nodes, for VMware VSAN, but this is for Starwind with Hyper-V.
Second advantage is the price. Starwind claims that it’s possible to achieve up to 40% costs savings when going for a bundle instead of acquiring individual components. In any case it looks like an better. VMware clients might not find their this interesting even if this might be an option for some ROBO sites. But clients running Hyper-V in their environments can definitely see a benefit from those bundles with guaranteed and tested performance. 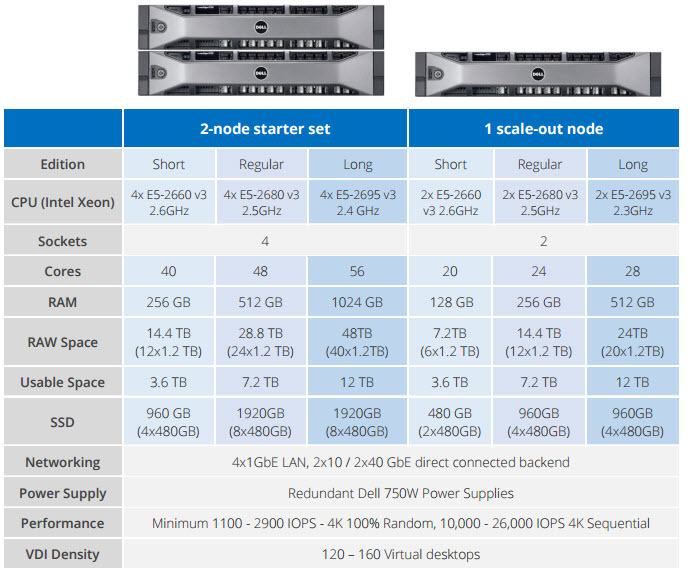 Since the introduction of VMware VSAN Ready nodes I like the idea more and more. The idea of leaving the complexity of assembling material together with the right storage, CPU, flash…. you know. Buying an performance certified offer is something to look on also when comparing with other offers of this kind. Check Starwind Hyperconverged Page here.